Spark Classic conical Stainless steel muffler, a really nice product made in Italy. total weight 2 kg. Conical variable diameter pipe adaptor 40-60mm. The total length is 370 mm. Included removable Db killer with M5 bold. 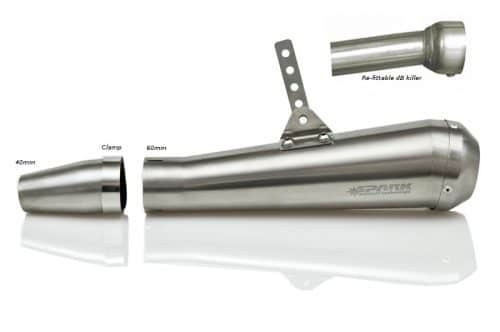 This muffler is a universal useable muffler, for motorbikes from 250 cc – 750 cc engine capacity. The spark logo is on both sides and mounting bracket is reversible so that you can mount these on either or both left and right side of bike.